"THE STRANGERS: PREY AT NIGHT and ANNIHILATION"
The Strangers: Prey at Night - I wasn't a fan of Bryan Bertino's 2008 movie The Strangers, so my expectations for its long-gestating sequel, The Strangers: Prey at Night, were admittedly about as low as can be. But surprise, surprise – the sequel is good, and a vast improvement on the original. A family of four (led by mom and dad Christina Hendricks and Martin Henderson) head out to spend a few days with relatives at a trailer park before sending troubled daughter Kinsey (Bailee Madison) to boarding school. Not long after they arrive, they're terrorized by three psychos. One wears a burlap sack over his head, while his two female assistants wear porcelain doll masks. Director Johannes Roberts (47 Meters Down) maximizes the inherent tension of the premise with some effective stylistic techniques. Many scenes utilize a slow zoom, so that we're far away when a scene begins, but up-close by the time something noteworthy happens. In other areas, something scary is in the frame, yet out of focus, so that we don't know it's there until it abruptly snaps into clarity. Several of the most frightening scenes are scored to '80s pop hits, including Marilyn Martin's unjustly forgotten ”Night Moves” and, for an amazingly tense scene in a swimming pool, Bonnie Tyler's “Total Eclipse of the Heart.” The effect is truly eerie. There's no larger point to The Strangers: Prey at Night. Its main purpose is simply to jolt the audience with home invasion nastiness. Good performances and a handful of masterfully-crafted scares allow it to work as an above-average slasher flick. 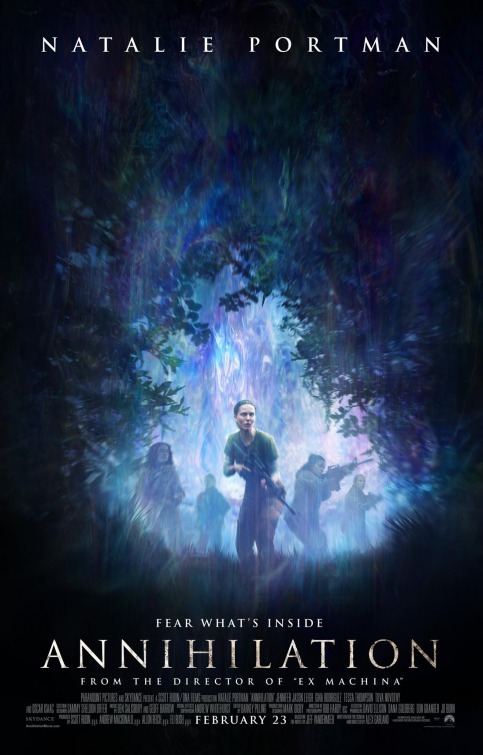 Annihilation - Annihilation is one of the best science-fiction movies I've ever seen. Like Close Encounters of the Third Kind, Dark City, and Arrival, it uses the genre to explore very human themes. The government has discovered an area of land overtaken by something they have dubbed “the Shimmer.” It's sort of like a bubble that mutates all plant and animal life within it. Natalie Portman plays Lena, a cellular biology professor recruited to enter the Shimmer and study it. Several other female scientists, including physicist Josie Radek (the superb Tessa Thompson) and psychologist Dr. Ventress (Jennifer Jason Leigh), accompany her. Lena's reasons for wanting to be part of the mission go beyond science, though. Her husband (Oscar Isaac) is the only surviving member of an Army Special Forces team that was sent in previously, and he's not the same since coming back. Lena isn't just investigating the anomaly, she's investigating herself. To reveal what happens within the Shimmer would be unfair. What matters is that the plot becomes substantially bolder and more provocative as it goes along, leading to a grand finale that makes your mind reel and ensures you'll be thinking about The Meaning Of It All long after you leave the theater. (On a more visceral level, you also get a genuinely terrifying scene involving a bear and some outstanding visual effects.) Annihilation touches on many issues, saying something about life and death, hope and hopelessness, reality and surreality. You never know where it's going from minute to minute, a fact that ensures you're riveted for the duration. Director Alex Garland, adapting Jeff VanderMeer's novel, has made a challenging sci-fi masterpiece that demands multiple viewings.